Welcome to Ageless Rug Treasures! I’m Matt. After college I needed to find a job and found myself walking into a rug gallery. I was smitten the minute I entered. I wanted one of everything for myself, was fascinated by the designs and beautiful colors…I even loved the smell of wool that greeted me. I asked if a job was available and was given one doing the manual labor. I was able to work around rugs and ask lots of questions. While there was plenty of sweat and aching muscles associated with the job I was still thrilled with it. An Armenian woman took me under her wing and taught and quizzed me about anything and everything associated with rugs. Day by day and month by month I constantly learned. Eventually I returned home to St. Louis where I also worked for a rug gallery. Again, my knowledge grew. By this point I subscribed to every publication concerning rugs and built quite the library of books concerning them–whether the topic was Persian court carpets of the 16th century or present tribal weaving I could never learn enough. After a number of years I decided to take the plunge and open my own gallery. After more 20 page business proposals than I can (or care to) remember my parents allowed me to spend some of the money they had saved for graduate school and go into business. Finally I had a business that would allow me to work around rugs for a lifetime. Since then (1997) I’ve had the pleasure of doing so! I love what I do. Selecting rugs excites me. I travel several times a year to do so. Finding creative new designs, fresh color palettes, and exciting new styles is a favorite part of what I do. I also enjoy working with customers and interior designers. Helping someone find that “perfect rug” is simply fun. It’s not only about finding a rug that works with the colors someone has in their home. It’s about finding a rug that someone is excited about, something that speaks to them. What kinds of rugs do I offer? I stock hand-knotted rugs (the definition of oriental rugs and Persian rugs) and hand-woven rugs (flatweaves like kilims, dhurries, and soumaks). 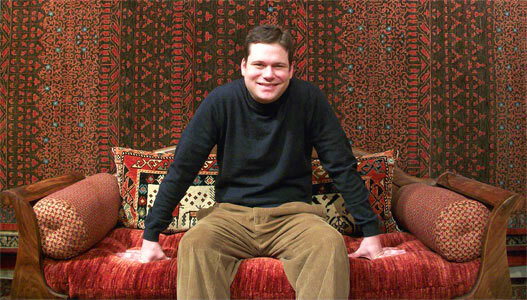 Originally all the rugs I offered were in very traditional, typically Persian, designs. While I still have a phenomenal selection of these rugs I now also have an exceptional selection of transitional and contemporary pieces. The quality of the rugs I stock is superb. I don’t care to sell the miserable products available at box stores. With some basic care one can expect my rugs to last a lifetime and often become a treasured heirloom. So, how much do my rugs cost? We have a very wide array of prices within the parameters of them being hand-woven. For example, an 8’x10’ rug can cost as little as $2,400 or as much as 10s of thousands. Considering that my 8’x10’ rugs require 2-3 weavers 6-8 months (or more) to produce, the value speaks for itself. Unlike at some other stores, every one of my rugs has a price tag on it. The price on it is actually the price you will pay. I don’t mark them up to then offer a “deal” in order to make a sale. I don’t have heavily discounted rug sales, liquidations, and the like. When someone has a sale with all rugs at 40% or more off the question to ask is “off what?”. The original price has typically been inflated. We do always have numerous “clearance rugs”. These are rugs that we’ve had in stock for some time and we’d simply like to move out. But, again, we don’t have storewide events with misleading heavy discounts. I know that purchasing rugs can be a very confusing experience. How does one know what quality a rug is and what a fair price for it is? How do you choose a rug that will be beautiful in your room? How large should the rug be, etc., etc. I’m more than happy to help you understand all this. It will help when you visit to bring fabric swatches, paint samples, throw pillows, etc. Some pictures on your camera of the space would also be helpful. If some rugs look to be possibilities I’m happy to deliver them at no charge for you to see at home overnight. If you don’t care for any of them it’s no problem. I want you to be happy if you make a purchase. I don’t believe in high-pressure sales—ever! You’ll find shopping here a relaxed experience. I’m proud to be a long-standing member of the better business bureau and of my A+ rating. I look forward to seeing you!